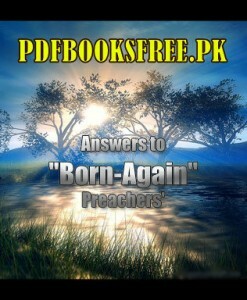 Answer To Born Again Preachers, In the name of Allah, the most Beneficent, the most Merciful. All Praise is due to Allah, the Lord of the Worlds, the [One Who] Sustains the Heavens and Earths, Director of all that is created, who sent the Messengers (may the peace and blessings of Allah be upon all of them) to rational beings, to guide them and explain the religious laws to them with clear proofs and undeniable arguments. I praise Him for all of His bounties. I ask Him to increase His Grace and Generosity. I bear witness that there is none worthy of worship except Allah alone, who has no partner, the One, Who Subdues, the Generous, the Forgiving. I bear witness that our leader Muhammad is His servant and Messenger, His beloved and dear one, the best of all creation. He was honoured with the Glorious Qur’an that has been an enduring miracle throughout the years. He was also sent with his guiding Sunnah that shows the way for those who seek guidance. Our leader Muhammad has been particularised with the characteristic of eloquent and pithy speech, and simplicity and ease in the religion. May the peace and blessings of Allah be upon him, the other Prophets and Messengers, all of their families and the rest of the righteous. All answers are provided by direction of Yusuf Estes, national chaplain and spokesman for ISLAM TODAY PROJECT, unless otherwise stipulated. The following is a reproduction of an actual dialog through email with a “born-again” Christian and the National Muslim chaplain, Yusuf Estes, who was a former Christian businessman and minister before entering into Islam in July of 1991. The simple beauty of understanding where people are coming from in their thinking and having proper knowledge of Islam and the methodology of explaining Islam (menhaj ad dawah), is demonstrated here to show how close some of the statements against Islam are to actually in fact verifying the proof that Islam is the only correct religion with Allah. These questions are from a man that Allah has been testing with belief in Christianity & Islam. The answers are provided from Today Islam’s Sheik Yusuf Estes. As we will see, many times the very objections and complaints that others have about Islam, can actually be used to support the correct teachings of Islam. The problem comes from the fact that all too often we do not know enough about what the people are meaning and not enough about our own religion. Notice the art of agreeing at the correct points and then bringing about a clear understanding in the other points without alienating the other person.